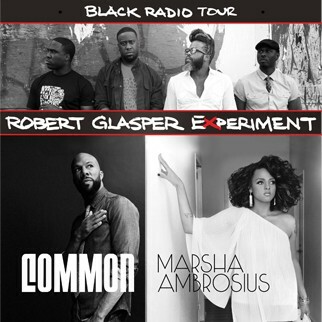 Black Radio Presents: Common & Marsha Ambrosius with Robert Glasper Experiment, a co-headlined limited engagement tour with Black Radio 2 guests Common and Ambrosius. The tour will make stops in cities including New York City (Best Buy Theater, Oct. 29) and Los Angeles (Club Nokia, Nov. 14). The NYC show details are below. « Journalistically Inclined Ladies: Join Zerlina Maxwell for a WAMentoring Session @TheNation!